Distribution: Isopods are one of the most diverse orders of crustaceans, with many species living in all environments, but are most common in shallow marine waters. Their greatest diversity remains in the deep sea. Virtually all of the 95 world families are represented by numerous species in Australia. Description: Isopods have three main body parts; the head, thorax, and abdomen. They have one prominent pair of antennae which are used to search, taste and smell food. They also have a second pair which are not seen, and seven pairs of legs. Isopods have seven separate appendages on the thorax and paired appendages at the end of the abdomen called uropods. Isopods vary in colour from dark gray to white, with and without pattern. The smallest isopods are microscopic and the largest, from the deep sea, 40 cm long. Ecology: During reproduction, the male isopod carries the female for a short period until the moult at which copulation occurs. The sperm are transferred from the male to the female genital duct. In most species , the female releases the eggs into a ventral brood chamber where they are incubated until after hatching. Some species incubate their eggs and juveniles in pockets of the body which open from the brood chamber, while others incubate them internally. Unlike crabs and shrimps isopods are not released as free-swimming zoea larva. Instead, when hatched they look very much like adults. Some species care for their young after leaving the chamber but most species do not. As a group some are scavengers feeding on dead fish,others are permanently parasitic on live fish by burrowing into the flesh, attaching to the gills or living inside the mouth. Some are burrowers with strong jaws chewing through wood and are able to digest cellulose using the microflora in their gut and some are herbivores which graze on seaweed remaining camouflaged to the colour of the algae in which they hide. Some isopods are predators capturing their prey with their first legs. 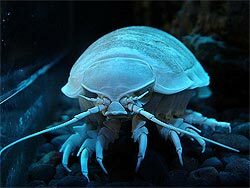 Interesting facts: The isopods are an ancient group with fossils known from the Carboniferous that only differ slightly from some modern species. There are 4000 known species. Status: Whilst the geographical appearance and disappearance of species is a natural phenomena in the natural world it is the pace of change in the distribution patterns of species which has increased dramatically. World wide studies show a large migration of some isopod species which for some species is a direct response to warming sea temperatures. Thus the issues of competition for food and habitat are very real.Specific species in certain areas in the world oceans may be useful as a sensitive indicator of the predicted long-term warming trend.